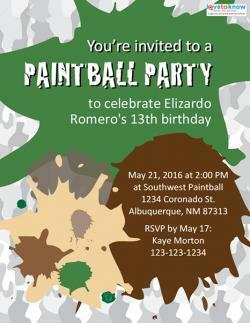 Paintball parties are wild and fun, so why not use your party invitations to spark excitement about your upcoming event? Bright splotches of paint will help you broadcast your theme to your invitees and let them know they're in for a lot of excitement, and by printing free invitations at home, you'll save money that you can funnel back into the party budget to make the event even more fantastic. 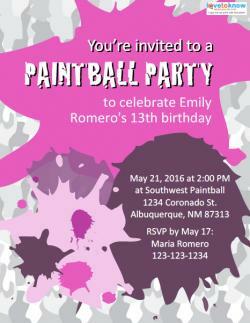 All the paintball party invitations on this page are available to print for free. You'll need to use Adobe to download them, and then you can insert your party details for your potential guests before you print them. Card stock usually works best for durability, especially if you'd like to mail the invitations through regular mail, but you can print them on paper if you prefer. Each of these invitations measures 8 1/2 x 11 inches, which makes them a good size for guests to post on their refrigerators as a reminder of the upcoming event. Simply tri-fold each invitation and seal it in a business size envelope. Just in case one of the designs above doesn't appeal to you, there are a few other sources that offer free printable invitations for this party theme. They all follow some version of the paint splat design that's so common, but each has a few unique design elements that makes it worth consideration. Hoover Web Design offers a quarter-page folded design that features the words Paint Ball Party in bold letters over colorful paint splotches, and there's a jar of paint balls in the lower corner. This printable doesn't include any wording, so you'll need to add all your party details after downloading. Fun With Printer Crafts has three different bi-fold invitations to download and print. All have colorful designs with phrases such as Put Your Game Face On!, Are You Game?, and Celebrate! Styles A and C are for paintball birthday parties, while style B is simply focused on the sport. Each template includes basic wording, so you'll need to write in your own details by hand. The site supplies detailed printing directions. Commercial paintball venues like International Paintball Group and Urban War Zone Paintball offer free invitations that display their company logos for their customers to download, customize, and print. Check the website of the venue you plan to visit to see if they offer free printable invitations as well. Your invitations should include everything that your invitees will need to know ahead of time so they're fully prepared for the event. 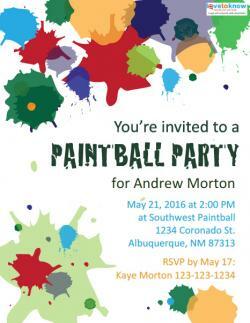 Print directions to the party, and include a list of paintball safety rules to enclose in your invitations. If your party will be held at a commercial venue that requires permission slips for participants, enclose copies of any paperwork or waivers that may be required by the managers. Including all of this extra info with your invitations gets it out of the way ahead of time so your party can get started as soon as possible once you all arrive at the venue.